I’m writing this letter to you from the Evin Prison. I am in a section with 25 other female political prisoners, with different intellectual and political point of view. Until now 23 of us, have been sentenced to a total of 177 years in prison (2 others have not been sentenced yet). We are all charged due to our political and religious tendency and none of us are terrorists. As an independent journalist, former vice-president and spokesperson of the Defenders of Human Rights Center (DHRC), and activist against the death penalty in Iran, Narges Mohammadi has long suffered from persecution at the hands of the Iranian authorities. 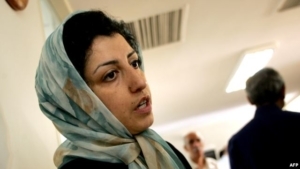 She has been banned from travelling abroad since 2009, and in the following year, Mohammadi was arrested from her home without a warrant and held in connection with her work with the DHRC. In 2011, a Tehran court convicted Mohammadi of ‘acting against the national security’, ‘membership of the DHRC’ and ‘propaganda against the regime’ for her reporting on human rights violations, and she was sentenced to serve 6 years in prison (reduced from her original cumulative sentence of 11 years). More recently, in May 2015 Mohammadi was arrested days after a fresh trial began on charges including “spreading propaganda against the system,” “gathering and colluding to commit crimes against national security” and “membership of an illegal organisation whose aim is to harm national security (Step by Step to Stop the Death Penalty). Mohammadi is the mother of nine-year-old twins, and the wife of prominent journalist and activist Taghi Rahmani, who has spent a total of 17 years in prison. They are both honorary members of Danish PEN. Through the Rapid Action Network, Norwegian PEN and the Writers in Prison Committee have appealed to the Iranian authorities for the immediate and unconditional release of Mohammadi. Click here to read our letter. In a May article, The Guardian commented on the international community’s reaction to Mohammadi’s imprisonment, and more specifically the High Commissioner for Human Rights’ condemnation of her 16-year sentence. To read the article, click here.